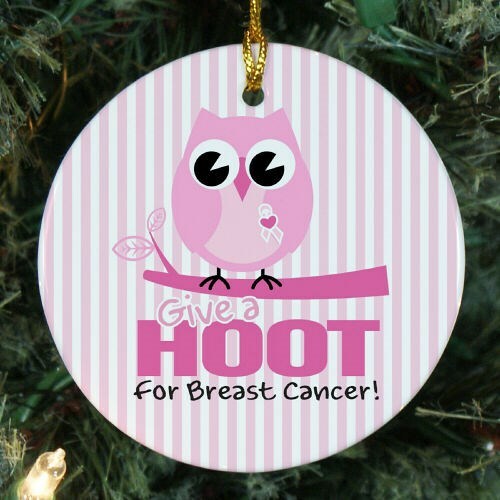 This Give a Hoot Ornament was designed and created with one goal in mind and that is to help raise the awareness of breast cancer. Celebrate any occasion with a gift that shows your compassion and support along with best wishes. Our Stylish Breast Cancer Awareness Ceramic Ornament is a flat ornament and measures 2.75" in diameter. Each Ornament includes a ribbon loop to easily hang from your Christmas tree. They nicknamed my mom "Hoot" at the assisted living facility where she lives. She loves this ornament. In fact, she wears it around her neck with her alarm! Here at, MyWalkGear.com, we know how important it is to raise awareness for breast cancer. That is why we have created a wonderful selection of Personalized Breast Cancer Awareness Gifts that show courage, strength, love and hope for those fighting with this disease. Shop now for all your Breast Cancer Awareness Gifts today and feel great knowing you helped contribute to this worthwhile cause.